I think this is my favorite Spinning Wheel so far! It's in size 20 HDT, of course! The color is Tuscany from Sherry Pence aka LadyShuttleMaker. I thought of my daughter Carol the whole time I was making it. She introduced me to the movie Under the Tuscan Sun, which I loved! Who knows? Maybe Carol will get this for Christmas! 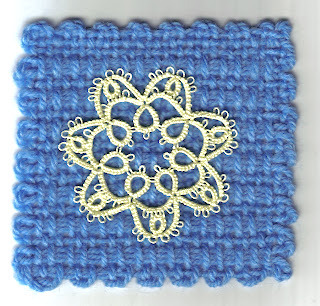 I finished my third Spinning Wheel glass mat from Tatting with Visual Patterns by Mary Konior last night. I think the secret for me is to always tat this piece in HDT! This one is size 20 Fuchsia from Sherry Pence aka LadyShuttleMaker. I think I have enough thread left from my 50 yd. skein to make a bookmark. The two pieces will be the perfect Christmas gift for a teacher friend of mine! All I have left to do is block it and wrap it! 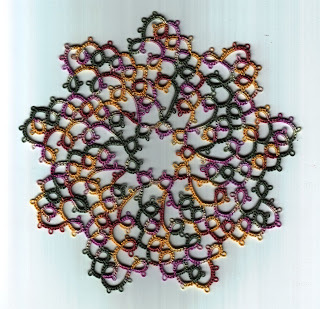 I've been working on "Spinning Wheel Glass Mat" from Tatting with Visual Patterns by Mary Konior for about three weeks. Imagine my dismay when I discovered that I tatted nearly the whole piece incorrectly! Of course, I didn't discover my mistake until the end. On each 3-ring row, the rings are NOT supposed to be joined to each other. I only did it correctly the first time! The rings on the top right are correct. If you click on the image to enlarge it, you'll see what I mean. I almost didn't finish this pretty little piece because I was so upset with myself... this is really a very simple pattern to follow! I won't give it as a Christmas present as I originally intended. Instead, I'll use it in one of my shuttle drawers as a backdrop for some of my beautiful shuttles! The finished piece is about 5 1/2" across. The thread is size 20 Lizbeth from Handy Hands, color #122. I need three of these little doilies for Christmas presents... I hope the next one doesn't take me three weeks! Isn't she a beauty? She looks exactly like her big sister Lily did four years ago! Yes, Grandma got lots of snuggle time with both her little Minnesota sweethearts! As all babies do, Ella made her presence known, but only when she was hungry! Here she is with her beautiful mother! Big sister Lily is a wonderful help. We can tell she adores little Ella! Lily was being a bit silly this weekend and put this face on instead of her smiley face whenever the camera was pointed her way! Yes, I let Grandpa have some snuggle time too! And Aunt Carol would have protested mightily if she hadn't gotten her turn in too! Aunt Joanne and Jan let us have all the snuggle time, so we had to settle for a picture of the two of them together! Daddy spent all of his time running around taking care of all of us and playing with Lily. We have a new granddaughter! Ella Grace was born at 1:29 this afternoon! She's 8 lb. 13 oz. and 20 3/4" long! Can you tell I'm excited? No pictures yet, but we're planning on driving up to Minnesota to meet her this weekend... I can hardly wait! Look what arrived in the mail today! Marilee's book is gorgeous! The photos are beautiful. The directions are clear. Every design is a winner. Congratulations, Marilee! I couldn't get online earlier to get my T.I.A.S. directions, so I sat down with an edging that I started last night. "Hedgerow" is from Tatting in Lace by Mary Konior. The pattern calls for size 20 thread, and I have quite a bit of that, so I decided to get started. I really like the way it's turning out. This is one full pattern repeat in Handy Hands Lizbeth size 20, color #122. The pattern says it adapts to a curve, so I'm hoping to attach it to a circular blank that I purchased earlier this year. Now that I'm online, I think I'd better get my directions! This was a fun little design to tat. It's in the new Lizbeth thread from Handy Hands, size 20, color #680. 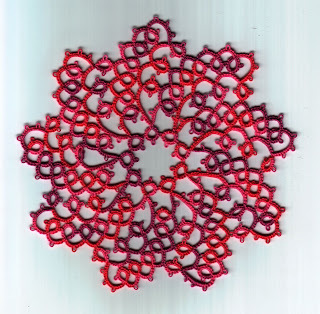 Christel Weidmann's book Tatting: 60 Original Lace Treasures has given me the mental break I needed. I'm starting to get back into the groove at school, so I think I can get back to something a little more challenging. I'm really feeling the pull of Eleonora, and I want to get back to the T.A.T. program. I'm sure Bonnie thinks I've forgotten all about it... I haven't forgotten, Bonnie! We'll see what I'm in the mood to work on tomorrow! I've done it again... I've been way to nice to me! And I don't even have a birthday or new job to celebrate! Yesterday I received a shipment of the new Lizbeth threads from Handy Hands. No, I didn't need another ball of thread. I have more shuttles than I can possibly use, and I need another tatting book like a hole in the head, but I did indulge! 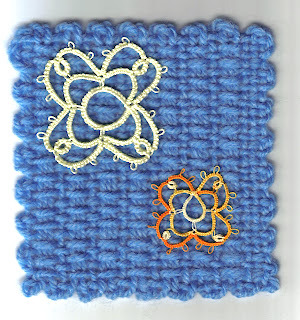 On the lower right you can see that I started Design 7 from Christel Wiedmann's book last night in Lizbeth color #680. I love the colors available in this thread! It's a bit twisty, so I had to drop my shuttle several times when winding it and while tatting, but that's a sacrifice I can make in order to use the colors I want. I love the new Sew-Mate shuttle colors, and of course I had to try the ones without the pic tips! I've been wanting Ben Fikkert's book for quite a while... the other two I bought on a whim. Years ago I had a country style wooden pig on a block that I kept in my kitchen. It was supposed to remind me that I had a Problem with Instant Gratification... P.I.G. The idea was that I'd stay on the straight and narrow and eat healthy food at appropriate times to maintain a healthy weight. It didn't work in the kitchen. I wonder if it would work if I put that little pig near my computer or my tatting supplies? Naah! Starting with #1... I don't have time to figure out how to put the logo on my blog this morning... but, it's really cute! #2... you can see it on Grizzly Mountain Arts' blog! The entire Tatted Ring of Bloggers... you all inspire me to keep on tatting! So, fellow tatters, please consider this my message to you that I "heart" your blogs! Knitspot by Anne Hansen... Anne's gardening adventures make me want to live exclusively on fresh vegetables, but I really read her blog because of her wonderful lace knitting! Now, on to business... my peg looms arrived yesterday, so I'm headed off to school early! Our library theme this year is "Weave your way through the library!" The kids are really excited about this, and I realized the first day that one inkle loom was not going to be enough to satisfy all these students! So, I ordered 3 peg looms... one each for the easy reader section, nonfiction section, and fiction section. The kids get to weave one row for every book they read. The kids have only been checking out books for a week, but some of them have already read enough books to weave several rows! One 4th grader has come in to check out a new book each morning! I love working with kids! 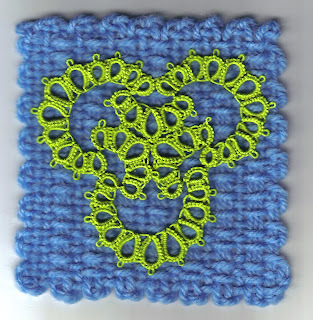 When I opened up Nancy Tracy's monthly Be-stitched newsletter, I knew I had to tat this adorable little horse shoe! I've only ridden a horse once, and I'm not likely to do it again, but I do like the idea of horse shoes! Dave and I have been west several times... Jackson Hole, Wyoming, Glacier National Park, Yosemite, Colorado, the Grand Canyon... so reading about Nancy's trip helped remind me of some of the wonderful sites we've seen. 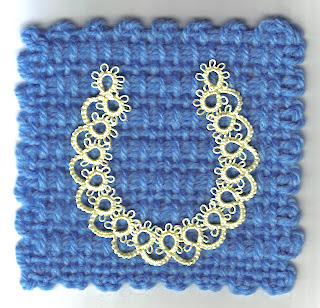 Nancy's directions are clear and easy to follow, so this little horse shoe was quick and fun! I like this one much better than Design 5. I don't know why... I just do! I think the next time I make this one, I may try adding some picots to the chains to give a lacier effect. I really do love the lacy designs! So, I decided that 7:30 was a bit early for bedtime... even for me! So, I tried Design 5 in size 20 Opera. 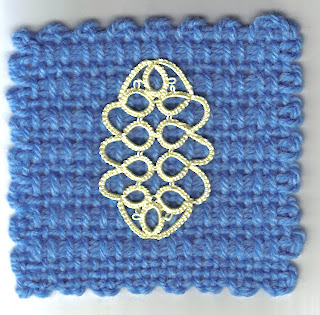 I think it turned out better because my picot sizes were more appropriate, but I still can't say that this motif thrills me. So... on to Design 6! 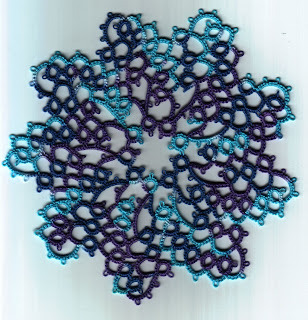 This is not my favorite design in Christel Weidmann's Tatting: 60 Original Lace Treasures, although it was a quick and easy tat. I think part of the problem was that my picots are too large for the size thread (size 80 Coats & Clark), and I was trying to make consistent picots with my gauge. I'd have been better off eye-balling my picots. I've learned that I do not like using my bone shuttle from India with size 80 thread... the shuttle is too heavy. I think I'll stick with my Clovers for the extra fine threads. 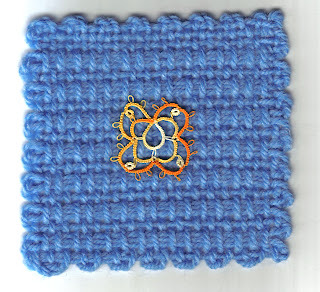 I haven't decided if I'll try this one again in a heavier thread or move on to Design 6. For now, I think I'm just going to say good night! 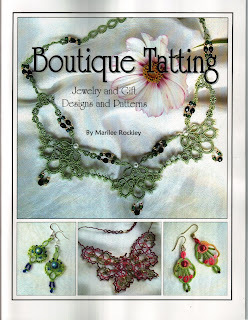 Yes, folks, I am still going with Christel Weidmann's Tatting: 60 Original Lace Treasures. Design 4 was another easy tat! The more I use the Omega thread, the more I like it. Still, I think I'll switch to something different for the next motif. I have so many threads to try. Why should I stick with just one?